Erlangen  is a city in Bavaria, Germany, near Nuremberg (Nürnberg). Home to the Friedrich-Alexander University and the Siemens company. One third of the residents are involved with the university (students, reseachers etc. ), and another third work for Siemens. Medicine is one of the specialities of the University, so you are in luck if you fall ill with over six clinics located within the city. Most travel around the city is done using bikes or busses. Trains and S-Bahn run regularly from Nuremberg. The trip takes about 20 minutes. Bamberg is about 30 minutes away in the other direction. Most ICE trains between Munich and Berlin stop in Erlangen. Bus connections to Erlangen are available from cities such as Cologne, Frankfurt, Munich and Stuttgart. The buses are mostly a lot cheaper than the trains, unless using discounts such as the Bayern-Ticket. See FlixBus for details. The tourist office is located in the center of the city, just next to the City Hall (Rathaus). 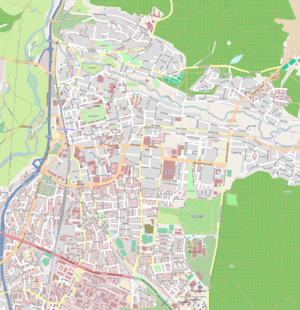 You can find almost everything regarding Erlangen in this  portal. There are a lot of taxi companies available throughout the city that are available 24/7. Bicycle is most probably the first choice of people, due to the very well organised bicycle roads and the small distances that have to be covered, to get around the city. Even if you cannot have your own bicycle in Erlangen, you can rent one at various local bicycle shops or at the main train station. In the heart of the city, everything is in a walking distance and there are a lot of pedestrian-only areas. If you need to cross a cycle lane with your car, be prepared to reverse if a bicycle approaches. When you turn, give way to cyclists. If you choose to drive in Erlangen, avoid downtown. There are several streets that are partially or entirely closed for cars. The best choice is to park outside downtown and walk. For a full list of museums, exhibitions and events in Erlangen check here  and select Mittelfranken. Schlossgarten, large green area surrounded by University buildings. Bergkirchweih : Held every Pentecost (Whitsuntide) for twelve days every year. Similar to Oktoberfest, but more German owing to the absence of tourists. In the year 2005 it marked its 250th anniversary. International Comic Salon Erlangen : Held every two years. The paradise of comics fans. International Figure Theater Festival : Held every year. International Film Festival for Horror, Thriller, Science Fiction and Obscure Films : Held every May in the Manhattan cinema. Poetry Festival : Held every year. Classical music by the lake : Held every summer. Stummfilm-Musiktage : Germany's most beautiful silent film festival with live music. Gemeinnütziger Theater- und Konzertverein Erlangen e.V. (gVe) . Local non-profit Union that organizes theater shows and classical concerts all year round. Stadttheater Erlangen . 3 different stages, among them the Markgrafentheater, which is the oldest Baroque theater in Southern Germany - built in 1719. It is worth visiting, even if you don't understand German at all. Theaterverein Fifty-Fifty e.V. . Cabaret, theater and music stage. Studiobühne Erlangen e.V. . Student theater association with roughly ten productions being staged every year. There are a couple of swimming pools in the city open for the public. You can find opening times and prices (in German) here . There is a golf place 15kms away to the east . Anniversary charitable football tournament "Football against cancer". Last Sunday of February in the sport hall of Friedrich-Alexander University. Nürnberger Straße is lined with a selection of shopping opportunities. Musica , music records and books. Ultra Comix , comic store. Prachtstück , jewellery, pearls, workshops. Leonidas pralines , chocolates and more. Prahse Antik , antique furniture. Messer Massari , japanese knives. The region is famous for the number and charm of its beer gardens, where in summer you can enjoy a cool drink and a bite to eat (Brotzeit = German equivalent of a picnic) whilst enjoying traditional music. Döner shops all along the Hauptstraße. TiO . Just across Arcaden, only 5 minutes walk from the main train station. BräuSchänke , located near the center of the city. Traditional German food and beer from the local brewery Kitzmann . Muskat , located in the Hauptstraße near the Schlossplatz. Organic food and beverages. Steinbach Bräu , it is hidden in the alleys of the city in the northern part, so tourists cannot easily find it. Traditional German food with fresh beer from their microbrewery. Unicum , located at the Rothelheimpark to the east of the city. During summers, the beautiful Biergarten is open. Elements . Restaurant, lounge, stage, living room. Lennox steak + seafood . Just next to the Martin Luther square (and church). Zen . Bar and Thai restaurant. Impressive building and interior. Located at the Theaterplatz. Murphy's Law  - Irish pub in Lorlebergplatz - has great chicken and mushroom pie. You can play darts and eat fish and chips at the Dartmoor Inn . Havana . Bar serving mainly cocktails. Lorleberg Café . Coffee place at the square of the same name. Sax . Meeting point of many locals for coffee and small dishes. Located directly at the Erlanger Schloss, nowadays the administration building of the Erlangen University. Paisley . House music, frequent events. Zirkel . The one and only (student) Disco in Erlangen. Hotel in Erlangen benefit from plenty of business travelers visiting Siemens or the university / university hospital. Hence, hotels in Erlangen can get away by charging much more than you would usually pay for the standard provided. You may very well be much better and at the same time cheaper off by staying in a hotel in nearby Nuremberg or Furth. AB Hotel  very close to the Theaterplatz in the center of the city. Quiet and clean, with free WLAN. 30Euro for Single bed and 45 euro for double bed. Youth hostel Südliche Stadtmauerstraße 35, +49 9131 862555, Fax:+49 9131 862119. DJH hostel. Preference given to under 26-year-olds. In the Freizeitzentrum, where you will also find a pool etc. Gasthof Schwarzer Bär  Innere Brucker Straße 19 (one block south of the train station), +49 9131 22872, Fax:+49 9131 206494. Single room with shower/shared €30/26; double with shower/shared €47/36; three-bed room with shower €62. Hotel Zeitwohnhaus  Classy business hotel close to the centre of the city (1km from Hbf). Great rooms with comfort apartments from $90 per day. Hotelchen Garni am Theater  as the name says, it is located in the Theater area of the city. Altmanns Stube . Elegant hotel in Theaterplatz with a restaurant also. NH Erlangen . Located in the city centre, this 4* hotel is within walking distance of many restaurants, bars and tourist attractions. Hotel grauer Wolf . Cannot get any closer to the center of the city. It incorporates a gourmet restaurant also. There are many interesting and charming destinations for sightseeing and day trips (or longer) in the Erlangen region. The surrounding countryside is beautiful (Franconian Switzerland, Franconian lake district) and there are many towns and villages of historical and architectural interest. This page was last edited on 23 July 2015, at 19:01.